ANAFI is the new generation of drone. It is the ideal go-to solution to film stunning high-quality videos and take outstanding photos, capturing the best moments of your everyday life. • The flying 4K HDR camera boasts exclusive video and photo shooting capabilities thanks to its unique 180° tilt gimbal and up to 2.8X lossless zoom. • Its ultra-compact foldable form means you can take this Parrot drone with you anytime, anywhere. • Quiet and resitant to extreme weather conditions, ANAFI has a 25-minute flight time with advanced performances. • Thanks to ANAFI's embedded Artificial Intelligence, take advantage of its automated flight modes to capture spectacular shots. This new generation of flying camera offers you the most advanced 4K HDR imaging system. 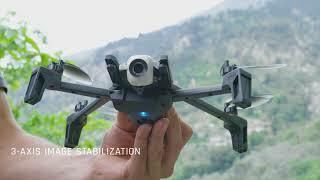 ANAFI is the first drone to feature a 180° tilt gimbal, capturing unprecedented shots from inimitable angles, up to 2.8X lossless zoom to visualize details clearly and 3-axis image stabilization to shoot ultra-stable videos and photos. ANAFI shoots all your escapades in ultra-high resolution, so you can relive your most magical moments over and over again. It has an integrated camera that offers stunning 4K HDR videos with 100Mbps bitrate and sharp 21MP photos. The 4K Cinema provides professional quality videos as it uses the 17:9 video format. HDR enhances all visible details by minimizing excessively bright lights and very dark shadows in your footage. ANAFI’s camera features a wide-angle aspherical lens. The optics of the lens were engineered to reduce lens flair and chromatic aberrations in all situations, resulting in sublime images. Photography is a walk in the park with ANAFI. Capture professional quality photos of every moment, as each instant is exceptional. To make sure each snapshot vibrates with life, ANAFI is equipped with advanced technology and features. ANAFI’s high-tech gimbal can tilt 180° vertically, ideal for new perspectives such as low angle images. The camera tilts from -90° to +90° vertically without sacrificing on quality. This unprecedented feature is a novelty for leisure drones, offering many new filming possibilities. ANAFI combines an integrated mechanical gimbal with ultra-precise digital stabilization for incredibly smooth shots. ANAFI’s innovative zoom technology enables up to 2.8X lossless digital zoom in full HD (1,4X in 4K), equivalent to an optical zoom. Lossless zoom allows you to get a closer without any resolution loss. Change the focal length to get close to the action while remaining at a safe distance. The carrying case, included in the pack, protects the drone during transportation. Once out of its carry case, ANAFI unfolds in less than 3 seconds. Parrot, the European drone leader, designs all its drones in Paris. ANAFI was designed with passion by a team of engineers dedicated to creating a sleek, robust and innovative drone. The carbon fibers of the structure are charged with empty glass microbeads that are filled with air and resist bumps and knocks. Due to this innovative material the drone weighs a mere 320g. ANAFI can be taken with you on all your adventures, anytime, anywhere. The collapsible drone unfolds in less than 3 seconds and fits in most bags and pockets. It comes complete with an equally tiny and foldable Parrot Skycontroller 3. The USB Type-C charging system reflects the drone’s portability. Charge the drone’s smart battery with a power bank or with the USB Type-C charging system of your smartphone or computer. ANAFI is compatible with Power Delivery chargers that charge up to 60% faster than regular 5W USB-A. ANAFI offers spectacular flight performance, letting you fly further for a longer duration. Using its cutting-edge technology, ANAFI allows you to capture your best moments, anytime, anywhere. Experience adventures like never before. Equipped with a smart battery and a powerful propulsion engine, ANAFI can fly and film for 25 minutes. Smart battery that features sensors designed to optimize the battery life. You can check the battery level at any moment using the led indicators. High density Li-Po battery for advanced flight performances. This remarkable new generation of drone resists winds of up to 31mph and reaches impressive speeds of up to 33mph in Sport mode. With ANAFI’s new transmission system, each drone leg contains a dual band antenna (2.4GHz & 5GHz), improving HD video streaming and the piloting experience up to 2.5mi away (*). The aerodynamics of ANAFI were optimized, resulting in one of the quietest drones of its category. Parrot understands how important peace of mind is to fully enjoy a flight experience. Geofence lets you define your very own virtual perimeter that stops ANAFI from flying out of a designated area. The Smart RTH (Return to Home) feature means that if the drone ever loses connection or if the battery life is low, it will automatically come back to its starting point. With Find My Drone, should you lose sight of your drone, you can easily make it beep at the tap of a button or find it on the map to locate and retrieve it. Get ready to fly ANAFI using FreeFlight 6, the new intuitive piloting interface. With a tap of your finger, make automatic drone videos using state-of-the-art A.I. Film and photograph your most memorable moments and share them on social media such as YouTube and Facebook. Execute cinematic videos using automatic CineShots. You have the option of four, Reveal, Epic, Rise, 360°. Take selfies from the sky using SmartDronies. Impress your family and friends with your stunning videos. Speed up or slow down your video in the blink of an eye without using complex software. The new interface of FreeFlight 6 promotes ease of use, offering a variety of flight solutions, adaptable to your level of expertise. The homepage along with the piloting interface were ergonomically thought out so that each user can easily access ANAFI's many features. Thanks to ANAFI’s innovative zoom technology, wake your inner moviemaker with Dolly Zoom that was inspired by the famous vertigo effect. The Dolly Zoom effect uses ANAFI’s unique zoom capabilities and its advanced visual tracking system to create a perspective deformation of the background. This feature is a Parrot exclusivity, and ANAFI is the only drone on the market able to do that automatically. ANAFI's outstanding Hyperlapse and Slow-Motion video modes are innovative features that require no editing. The Slow-Motion mode records automatically, instantly adding a slow-motion result, ideal for all your sport or action based videos. The Hyperlapse mode immediately accelerates your videos so you can capture a sunset, a sunrise or even passing clouds. ANAFI, BY YOUR SIDE ALWAYS THANKS TO ITS CUTTING EDGE A.I. Cameraman is an automatic framing assistant for all your aerial videos. All you have to do is control the movement of your ANAFI drone whilst the subject is automatically framed. Follow Me* enables you to stay in the heart of the action at all times. ANAFI films you on the go without anyone piloting the drone directly. In complete autonomy, ANAFI follows you and moves at your pace both horizontally and vertically. SmartDronies let you take automatic aerial selfies. Create fun moments with your friends and share them on your social media in a click. Cineshots let you take automatic cinema style videos. Get the best out of your ANAFI photos!